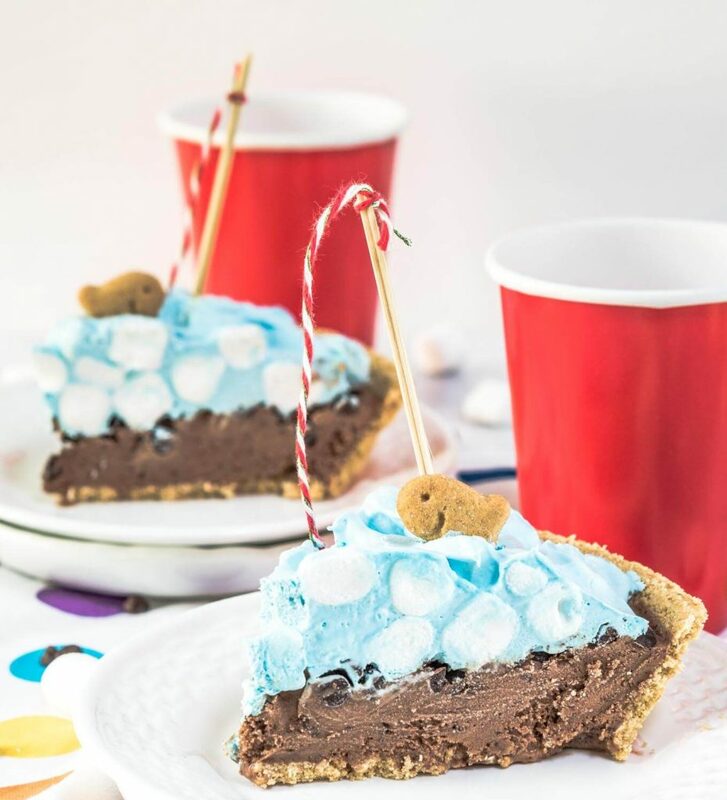 Gone Fishin S’mores Ice Cream Pie is a quick and easy dessert. Everyone is guaranteed to catch a fish and love this delicious treat. 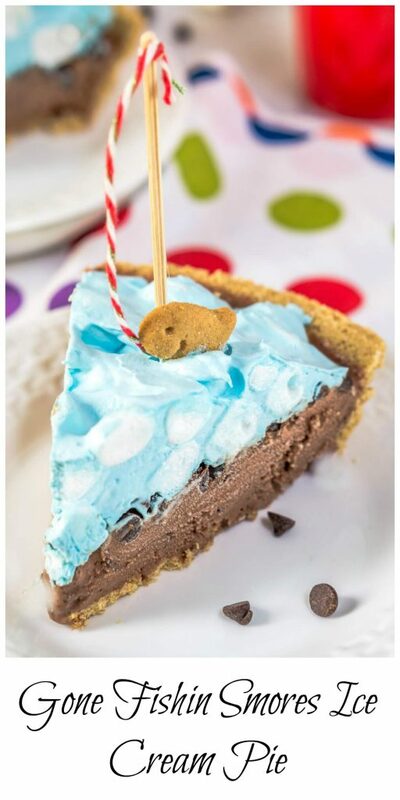 Gone Fishin S’mores Ice Cream Pie post is sponsored by Baker’s. This recipe and opinions are 100% my own. Did you know that there’s an actual “National S’mores Day? Yep, it’s August 10. It seems like there’s a day for about everything. For example, there’s even a “National Mustard Day” but that doesn’t have the same impact on me as “National S’mores Day”. I had to make something to commemorate this occasion, and my Gone Fishin S’mores Ice Cream Pie definitely does that. Besides “National S’mores Day”, the kids in the neighborhood will be getting ready to go back to school. We have a ritual that we have a back-to-school potluck. They always request that I bring a dessert. This year I’ll have a little surprise for them. I know they’re going to love this pie and the little fishing line just waiting to hook that fish. 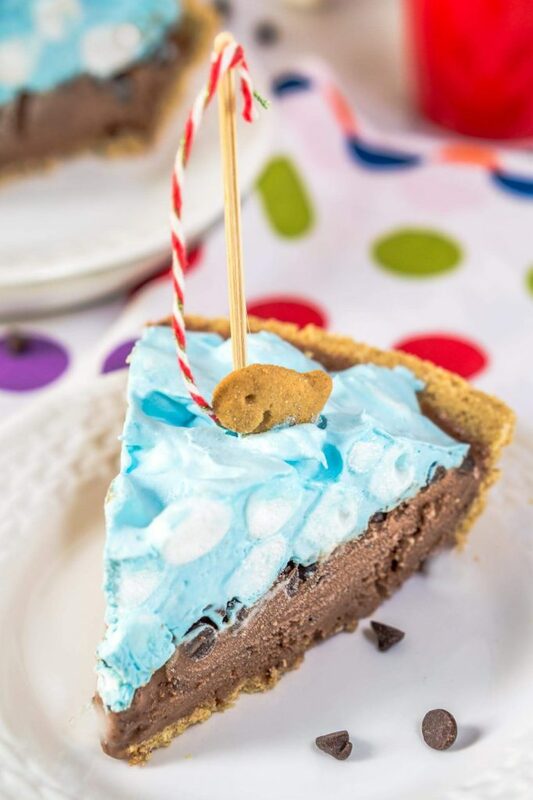 I wanted this pie to be quick and easy, so this little fishy pie is semi-homemade and perfect for your fisherman or those kiddos who would love to dive in. I added one fish per slice but you can top it with a whole school of fish if you’d like! 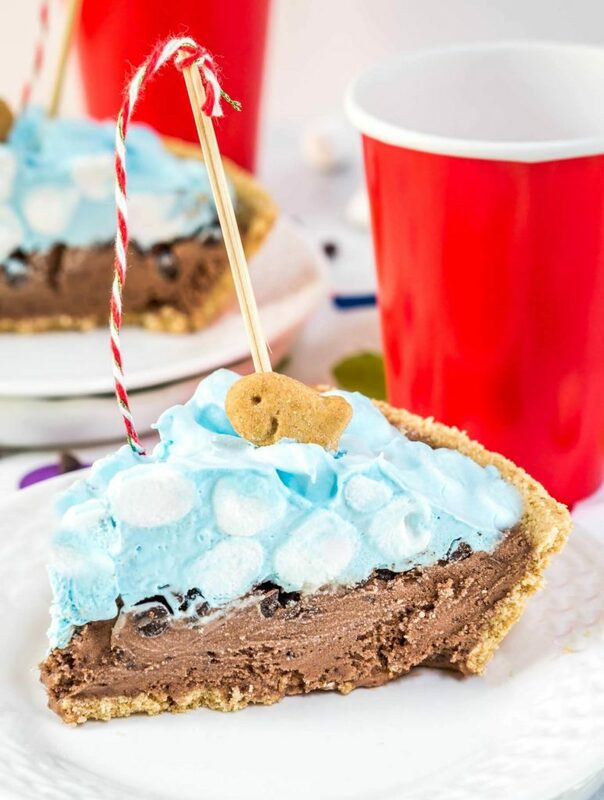 Gone Fishin S’mores Ice Cream Pie is a quick and easy dessert. Everyone is guaranteed to catch a fish and to love this delicious treat. Add the ice cream to a blender and blend until smooth. Pour it into a ready to eat graham cracker crust. Sprinkle the top with chocolate chips. 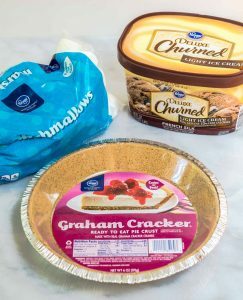 Put the pie into the freezer and allow it to partially set, approximately 15 minutes, while you prepare the creamy topping. 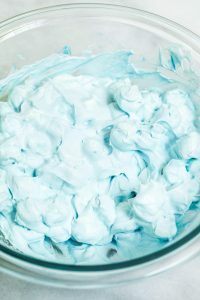 In a large bowl, add 1 cup of whipped cream topping. Add drops of food coloring until you get the shade of blue that you like. Fold the marshmallows into the whipped topping. Top the pie with whipped cream marshmallow mixture. Return the pie to the freezer and allow the pie to freeze completely, approximately 2 hours or overnight. To make the fishing poles, cut a length of a wooden skewer. Tie a colored string to one end. To serve, cut slices of pie with a warm, dry knife. Stick fishing pole into each slice and add a fish. Serve immediately. Putting the ice cream into a blender makes it a lot creamier than if you just let it soften at room temperature. [br][br]Prep time includes freezing time. I purchased all of my ingredients (and more) at Bakers Supermarket. I would like to thank the Kroger Co. for supporting this post and Hostess At Heart. For another cool dessert idea, take a look at my Mango Sorbet! It’s also quick, easy and delicious! Now it’s time to share. I’m heading over to Fiesta Friday for some more great recipes! Let’s keep in touch! You can find me on Facebook, Twitter, Pinterest, Instagram, Google +, and Bloglovin. Or better yet, enter your email address in the box below and never miss a recipe! Thank you Julianna! It was delicious and fun to put together! Ah! This is fantastic!! I know that if I were one of those kids at the potluck (and even now!) I’d just want to eat the entire thing. This is amazing. Awesome job, as usual! Thank you so much Justine! John and I did a pretty good job gobbling it up too. Kudos, Judy! What an adorably delightful, fun (and delicious!) dessert. Hugs. Thank you Teagan! I appreciate you stopping by! Super hugs your way too! Super cute Julie! I love icecream pies! So cute! Saved and pinned! Thank you so much Angie for featuring my little fishing pond of yumminess! I love your pie, Julie! It looks so cute with the waves and the fish 😀 Awesome! And super yummy too! Thank you so much Sarah! It was so much fun to make too! What an adorable pie Julie! It’s so cute, the colours are perfect, and it sounds delicious too! Love the cute touch of the red and white fishing line and the cheerfully smiling fish. Thank you! It was such a fun recipe too. Thank you Petra! It was a fund recipe and super easy. Thank you so much for co-hosting FF! Thank you Jhuls! Definitely child and adult friendly! Thank you, Michelle! I’m so glad that you stopped by and enjoyed this recipe. This was a super fun pie to make. NO Baking involved Swayam! It’s a great project for D to help you with! Thank you dear! This is so adorable, Julie! I love it. How clever you are. The fishing pole and fish are so cute. And the pie, yum! That ice cream sounds heavenly. Your neighbors are going to love it! This is so cute!! My fisherman husband would love this! He was doing a great job landing the real thing too! Thanks Debbie! Gorgeous photos, Julie! 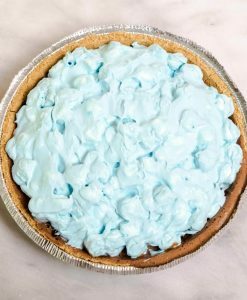 This pie looks like a picture of summer!! Looks delicious! As soon as I scrolled down and saw that pie, I just had a big smile! It’s so fun with the blue topping and fishing pole.. I love that ice-cream blender tip! Thank you! It was definitely a fun pie to make…and eat! Thank you Anna! They would love it! Smores are a traditional American treat during the summer months. We always made them over a fire down by the water. Love the idea of using ice cream – another favorite during the hot days of July! Thank you Judi! I’m an ice cream lover too! Great pie, super cute and easy. No cooking is just fine with me. Love the blue!! So cute! Pinned 🙂 We love S’mores anything in our house. I can’t wait to make this! Thank you Sarah! I want pictures! So good to hear from you dear traveler! I have loved your photos and hope you had as wonderful a time as it looked! So adorable and I bet delicious! The kids will love this Julie! Thank you Johanne! I had a little too much fun with this one. This is super cool Julie! Yummed it! Thank you Sonal! So good to have you back!